Summer is over and the weather is cooling down. The days get shorter and the nights grow longer. The leaves are changing colors and falling to the ground on our yards, on the road, and even in our gutters, which may cause a problem. You see when leaves, sticks and other debris fall into our gutters, they cause clogs in our gutters. When gutters get clogged, they can’t do their job of moving precipitation away from your home and your home runs the risk of experiencing various kinds of damage to your home. When gutters get clogged, that water still has to go somewhere. Water retention may occur on your roof, which can damage it. Water may also spill over the roof and onto the sides of your house, rotting your siding. If enough water collects on your roof or falls onto the sides of your house, then you’ll have to worry about expensive repairs. When gutters are functioning properly, they move water away from the house and into an area of the yard that can absorb the extra flow of precipitation. On the other hand, the water from clogged gutters simply falls toward the foundation of the house which can cause cracks in the foundation and collect in the basement. This can cause the formation of mold or areas to rot inside of your house, which can again lead to expensive repairs. Gutters filled with debris can lead to areas of stagnant water. Insects like mosquitos and flies are attracted to stagnant water and use places like that as a home and place to produce more of their kind. Birds, squirrels, and other critters also like the debris filled gutters as places they can use for making their homes. Having pests like these use your gutters as their home puts your family at risk from getting sick from diseases like the West Nile virus as well as damage your home. 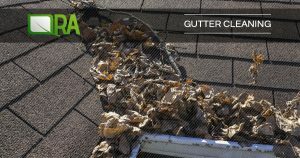 Cleaning out your gutters can be a preventive measure for expensive and invasive repairs as well as a being a way to keep your family healthy. Cleaning out your gutters at least once a year around this time of the year can help you retain the beauty and value of your home, and won’t become a burden to your finances.